Sunday morning started as a beautiful sunny day with temps in the upper 60’s. We jumped on the tram with destination Letzigrund Stadium. Fortunately the #2 stopped right at the stadium. In Europe GA tickets work different than at home. Here we all get a wristband, a number is chosen and that person is #1 in line. In Europe fan organized groups give out numbers, conduct roll calls every so many hours and are considered official. It’s interesting that a loosely knit group of fans determine who gets into the stadium first! Due to changes in our traveling party, we ended up with 2 FOS tickets and 2 seats but only 3 going to the show. Jo had to decide between standing with me and sitting in the seats. When we arrived at the stadium we found out they were at #34 and that roll calls were at 1, 5, 8 and 11 and then 8, 11 and 2 the next day. 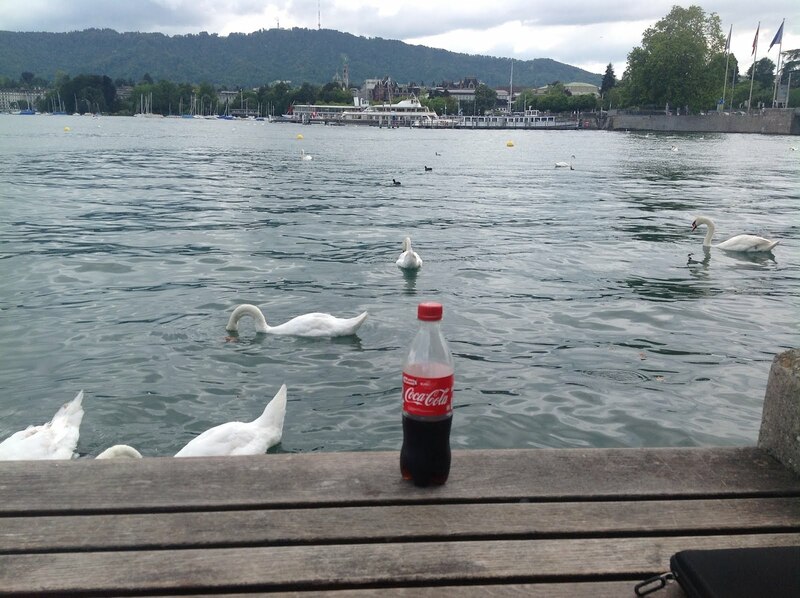 That made Jo’s decision really easy – if she did the roll call thing she would miss seeing Zurich. So I took #34 and the girls were off to sightsee. I did get to spend some time downtown by the lake Sunday afternoon and made all the roll calls during the day. At the same time I met a bunch of other Americans that were at the show – Lynn and Becca from Baltimore (Becca had sang Waiting on a Sunny Day with Bruce in Atlanta earlier in the tour), Howard and Marcy from Jersey and Jennifer and Steve from Portland. All great people and we killed time hanging out together. 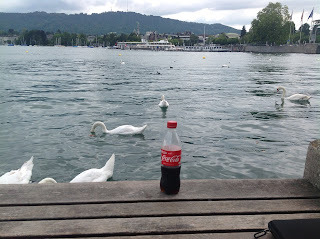 While I spent at the lake in the center of Zurich I got to enjoy a great pretzel and an ice cold Coke! Late in the afternoon I caught up with Jo and we had a nice dinner outdoors at a traditional Swiss restaurant. After some sausage and bratwurst it was off to the stadium for the next roll call. Although the roll calls are a pain in the neck they definitely reward the loyal fans. I wouldn’t make a habit of doing them as you spend all your time checking in but as a one-time experience it ended up being worthwhile. Fortunately the Swiss tram system is so efficient you never have to worry about being late to anything! After the 11 PM roll call it was back to the hotel to get a good nights sleep before show #1.